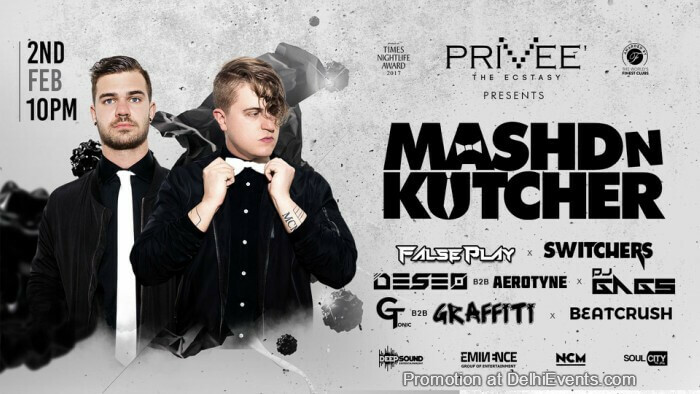 What better way to bring in Friday then a massive party with the two Aussie legends Mashd N Kutcher! The Time Has Come to Experience A whole New Madness this Friday at your favorite nightclub Priveé! Be there for a raving #EDM set that will be on your mind long after the party is over, curated especially for you! Having clocked up millions of views on their mash-up videos and over 1 million likes on Facebook this dynamic duo hailing from Brisbane will play the headline set this Friday along with a huge line-up of acts. Since meeting each other in 2014, the classically trained pianist and drummer merged as a duo with a mission to defy what is considered to be ‘normal’ in electronic dance music. Creating a concept for a live show, that combined their love of music and the incredible array of skills as multi-instrumentalists, DJs, and producers to develop a world-class live show – proving themselves as not just musicians and DJs but creative masterminds and all-round entertainers.